Sierra Hash Review – Suspicious Bitcoin Mining Operation! As you will learn throughout our investigative review, Sierra Hash is a curious Bitcoin operation that appears more legitimate than the majority of crypto sites that we review. Promising great service at a low price, who could dispute such desired traits amongst cloud mining operations? Miraculously, SierraHash.com has been able to amass a user following of over 240,000 investors within only 19 days of server up-time, or so they claim on their site. Regardless of the assertions made on their site, we will swift through the facts but more importantly the misconceptions featured at Sierra Hash. Learn for yourself why this cloud mining operation is more likely to scam investors than your typical Bitcoin doubling scheme and whether or not this is a trustworthy operation to invest with. SierraHash.com is an online cloud mining service tailored towards mining Bitcoin. Featuring a minimalist and straightforward site interface, SierraHash effectively masquerades their operation as the “latest and greatest” cloud mining platform. Uncharacteristically different than competitive cloud mining destinations, Sierra Hash does not provide tier formatted mining packages, but instead a fixed daily hash power return between 10.154% to 16% as long as investors deposit between 0.001 BTC to 25 BTC into their platform. How does Sierra Hash Work? Sierra Hash requires visitors to deposit bitcoins into their platform before they are eligible to receive free hashing power generated by this sites mining rigs. According to the site, Sierra Hash has mining rigs running with 99.9% up-time while their data center is allegedly based out of Reykjavik, Iceland. No mention of which mining rigs that Sierra Hash are employing ןד disclosed, so we are unable to verify their alleged active hash power. To add to the bewilderment of the Sierra Hash operation, the hashing power allegedly outputted by Sierra Hash operates on a remarkably high outage. A deposit of 1 BTC will supposedly allow an investor to receive 409,910 GH/s of hash power while allowing them to yield an annual return of over 37 bitcoins. 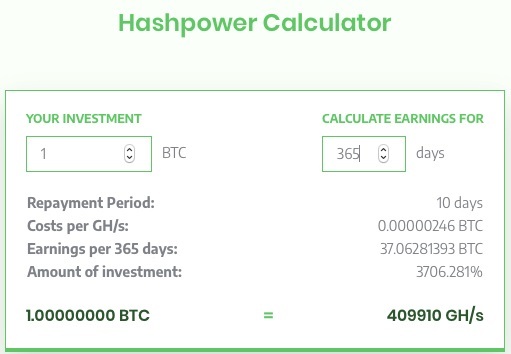 As indicated in the hash power calculator image above, this operation will allegedly accrue an annual return of over 3,700% when other legitimate mining sites are, on average, reporting annual gains between 25% to 30%. Does the site promise unrealistic returns? The promised hash power and ROI disclosed at Sierra Hash certainly lie within the confines of being too good to be true. For future reference, if you come across a mining site claiming to generate annual gains over 50% then more likely than not they are a scam operation. Is there information regarding the owner of the site? Located on the Support page of Sierra Hash we are provided with the corporate entity and office address of Sierra Hash. A CompaniesHouse report will confirm that the corporate entity Sierra Hash Ltd is indeed an active corporation that can allegedly be visited at they registered office address of 44 Hays Mews, London, United Kingdom, W1J 5QD. 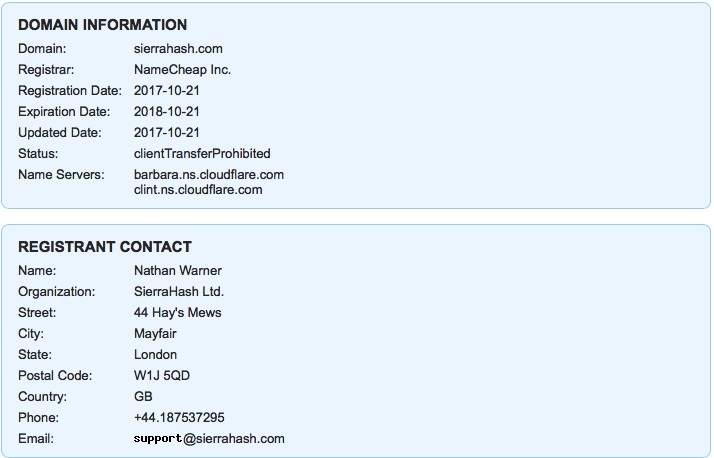 Filed under company number 11028303, Sierra Hash Ltd is directed by a British citizen known as Nathan Warner. How old is the website? A whois.com search will reveal that SierraHash.com was created on October 21st, 2017. The registrant behind this domain is listed as Nathan Warner, the alleged director behind Sierra Hash Ltd. The listed email address on file is [email protected] while the disclosed telephone number is +44.187537295. Are any legitimate sites associated with the website? No authentic sites appear to share an association with the Sierra Hash site. This could partially be contributed to how recently the site was created and how it is not a popular cloud mining destination. Are they evasively portraying their operational model? Absolutely! Like most investment schemes that enter the cryptocurrency niche, Sierra Hash is providing as little information as possible regarding their operational equipment, mining methods and data centers. No Bitcoin transactions are featured on the site either which means that there is no verifiable evidence that this operation is even mining bitcoins. Do they employ promotion over substance? Yes, just like many related mining platforms we have reviewed the creators behind Sierra Hash seemed determined to rely more upon advertising and promoting their affiliate program than the actual mining process being conducted on their platform. It appears that the sole objective of this site is to draw in as much fresh blood as possible within the shortest duration of time. How popular is the website? SierraHash.com possessed an Alexa.com global rank of 24,145 as of December 5th, 2017. The site is mostly popular in India, Russia, Italy, Brazil and Iran. According to the report, over 40% of the sites cumulative traffic originates from the traffic exchange site adbtc.top, where users get paid to browse their site. This creates the illusion that the site is much more popular than it organically is and is certainly the case with Sierra Hash. Sierra Hash it designed to become the perfect low-profile Ponzi scheme. Throughout the upcoming months to come we expect many investors to have their bitcoins stolen by the Sierra Hash operation. As we have mentioned before, when it comes to cryptocurrency investing, make sure you only deposit into operations that are fully transparent and provide abundant information regarding their crypto hardware. Review Verdict: Sierra Hash is a SCAM! Have you been searching for legitimate mining operations but aren’t sure where to begin? Feel free to browse our Cryptocurrency Mining Guide to learn about transparent and upfront cloud mining sites currently available. Please share any thoughts, experiences or feedback you may possess by leaving a comment below. Conhecem este dois? (startminer.com – btcminer.services). Mais dois de uma lista enorme, não consigo entender como sites iguais a este conseguem enganar tantas pessoas e ainda permanecerem na ativa. We’ve exposed Startminer.com and BTCminer.services as scams! sierrahash.com’s server IP address could not be found. I invest but now can’t open the page also.i feels bad because my husband invest and also my Son to .i don’t know what to do . Seems you can update this now to confirmed SCAM. Sierrahash has fallen completely off the public network with all the bitcoin they were able to heist as far as I can tell. fortunately only put in spare tiny change but despite this looking at this on behalf of all and greater learning of the space. I would recommend that anyone who believes is a Ponzi contacts the FCA actionfraud.police.uk/fraud_protection/ponzi_schemes at the very least they can work with companies house to prevent any new company being created. Im also invested in sierrahash here in philippines. But I dont recieve my first pay out until now..
i’ve deposited 0.006 from sierrahash. and now i can withdraw my balances. Can be usefull: Sierrahash.com Bitcoin address output: 3BTiBAEjmsP6aAkECJjb7qmqCT1srYesM9 hash:bbdaa1e09e11894a3140e1737aacf16c7a5d3bf8bc9d6475ecbaf9ac9d88d4c6 . Maybe some expert can found Mr Nathan Warner (if it’s his real name). Ich hoffe das hier man solche Leute findet im Zeitalter von NSA FBI und James Bont und den ehrlichen Usern wenigstens das zurückgiebt wa sie eingesetzt haben. !!!! It is a scam! Stopped paying people on December06. Do not put your money in! In fact, if any websites claim to warranty you a 100% pay in 10 days/30days, please be suspicious and do not trust: THERE IS NO SUCH THING as EASY and “IN THE BAG” sort of money. Yup you can’t withdraw now, wallet is gone, they made a nice 150 btc in 21 days and ran. Le site fonctionne pour continuer à arnaquer les gens mais il n’est plus possible de transférer les gains (payout). Tu peux réinvestir les gains pour plus de puissance de calcul mais c’est inutile, le gentil monsieur s’est cassé avec le pognon … . Sierrahash.com est hébergé par Namecheap.com en Allemagne. J’ai essayé d’avoir un contact avec l’administrateur du site arnaqueur mais j’ai eu un refus. Si seulement j’étais un hacker …. I have tried to get a payout all day. Nothing. I have tried to contact support on the site but no response. Both the company director and the shareholder are on LinkedIn. Cant reach bitcoin API. Please try again later! now sierra hash is one of the ponzi scheme site …. I found this site via Instagram advertisement on my news feed. So I figured if Instagram is going to advertise this it may be legit and signed up. I put $300 worth of BTC and get a 10% return which is currently paying. But this does seem like “the perfect low-profile Ponzi scheme” mentioned above, I’m just hoping to get my $300 back in the next few days. Yea site will not allow you to withdraw, I was only able to get $120 back from my $300. But this is the price you pay when you are after quick money. Moving forward these sites only stay up for 14 to 21 days if that so if you get in on day one you will be able to manipulate these scams and make your money back and some. Will do better next time, this was a first. It’s currently paying. I’ve made back what I’ve put in so far (about $26 worth of btc) at the time of writing and it has been a 10% return a day so far. Sierrahash withdraws disabled. Game over. The site is up, but withdrawal requests are failing. Probably toast. It paid out daily for me, 3 days, until today. why did you say? everyone can’t withdraw the money at 6th Des, It’s succes cheat us….